When Melissa Etheridge sang "Bring Me Some Water", listeners responded with waves appreciation. When she invited fans to "Come To My Window", fans came in troves showing love and appreciation. Such is the drawing power of American, iconic singer-songwriter, guitarist, and activist Melissa Etheridge. This time Melissa Etheridge is calling out to her followers to flock to this dynamic, fun-of-a-kind experience. The wheels of her latest concert tour has been set in motion. 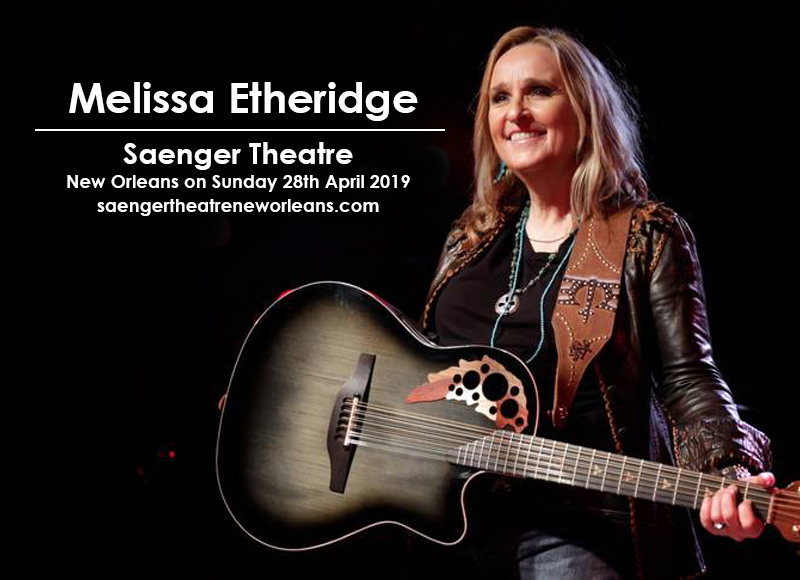 Melissa Etheridge will be coming by to rouse, rock and roll this town with a one-night-only concert engagement on Sunday 28th April 2019, at the Saenger Theatre – New Orleans. Don't miss out on this one, book your tickets now! Melissa Etheridge's prodigious guitar playing at the age of 8 certainly has gone a long, long way. In her teenage years, she played a lot of country music, got accepted in the Berklee College of Music, then made a tremendous leap of faith — dropping out of school and moving to LA to chase her rockstar dreams. Playing in local bars and achieving underground success became her stepping stones that led to the release of her breakout single "Bring Me Some Water" in 1988. From there, one thing led to another. Etheridge earned her first Grammy Award nomination for Best Rock Vocal Performance, Female. Then she claimed her first Grammy award in 1993 for the single "Ain't It Heavy" from her third album, "Never Enough". Soon afterward, she released what would become her mainstream breakthrough album, "Yes I Am", that spawned the tracks"I'm the Only One" and "Come to My Window", both clinching top 30 chart positions in the United States and scooping another Grammy award for Etheridge. The album "Yes I Am" is RIAA certified 6x Platinum — making it her biggest hit album to date. In 2011, she also received her own star on the Hollywood Walk of Fame. Melissa Ethridge is loved by many for her confessional and relatable songs delivered with her signature smoky, soulful yet raspy vocals. She is also admired by many for her staunch support for the gay and lesbian movement and is a breast cancer survivor. With her illustrious career of 3 decades, Melissa Etheridge is a force to reckon with, an admirable and influential figure in rock music history.